Last month I wrote about a movie entitled Ashes In The Snow. I cannot wait to see it especially after I just finished reading the book of the same title. 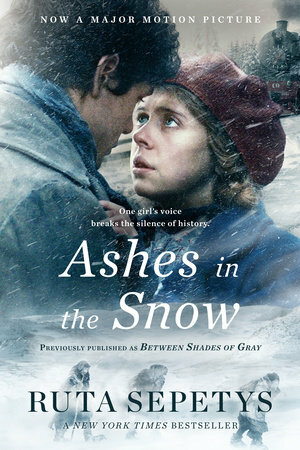 Originally released as Between the Shades of Grey now changed for a movie tie in, Ashes in the Snow was beautiful written in all it's horrifying glory. I not only read it, I saw it. The author did an amazing job of creating emotion that was palpable. While fictional characters just knowing this was based on a true time in history made each death even more moving and horrifying. I found myself tearing up many times realizing that 20 million innocent people lost their lives under Stalin. Lina and her family were forced from their home by Soviet officers. Separated from their father they must do what they can to survive while others all around them are dying. On a packed train living on rationed bread the Lithuanian people dream of home and wonder where they are heading while under the brutality of soldiers who have no qualms about shooting, beating or using people they believe are dirt under their feet. While the story was gut wrenching at times, the writing was perfect. Each character no matter how small was very developed leaving pieces of themselves with you long after you close the book. I recommend this book and believe that middle schoolers should be given the book to discuss. It also has a discussion guide in the back. This book of endurance, hope, love, loss, and strength.